Chadron junior Wade French (standing) wrestles with New Mexico Highlands opponent Chris Collins, during the Eagles' 25-21 dual win over the Cowboys, Friday, in Las Vegas, New Mexico. 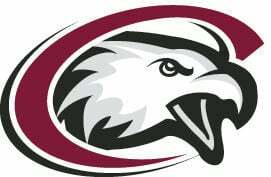 Four Chadron State College wrestlers won both of their matches during the Eagles’ trip last week for duals at New Mexico Highlands and Adams State. The double winners were Chase Clasen at 149 pounds, Jake Otuafi at 157, Matt Hebel at 174 and Wade French at 197. All four are juniors. Clasen now has a 9-4 record, Otuafi is 8-9, Hebel is 9-8 and French leads the Eagles in wins at 10-6. Clasen won a major decision at Highlands and Otuafi managed a pin in Las Vegas. All the others wins by the members of the quartet were regular decisions. Chadron State also had two more winners at Highlands. Brandon Kile pinned his foe at 133 pound and Tate Allison was a 9-8 victor at 165. Chadron State won 25-21 over the Highlands Cowboys, but Adams State was a 28-12 winner the next day. The Eagles are 3-3 in dual action this season. 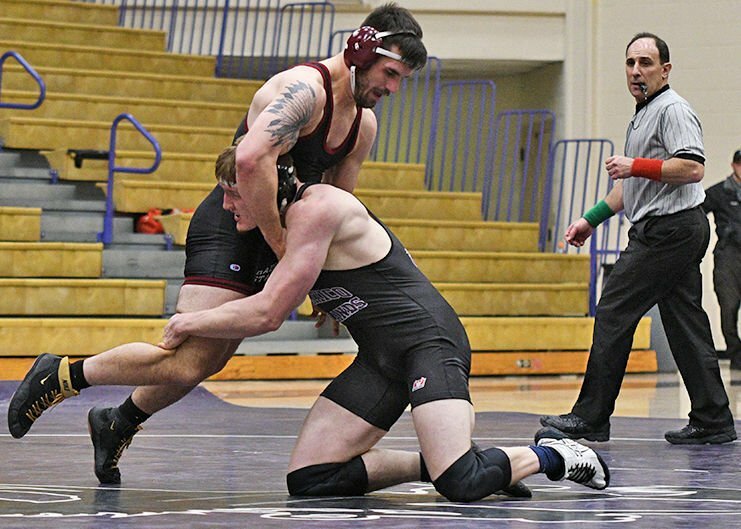 CSC forfeited the 125-pound weight class both days because Clay Eagle, who has filled that slot all season, has a minor injury, Coach Brett Hunter said. Hunter added that Eagle probably won’t compete Thursday night when the Eagles visit Colorado State-Pueblo for another dual, but should compete after that trip. The Eagles will dual Colorado Mesa at 6 p.m. Thursday, Jan. 17 in Rushville, Hunter’s hometown, and then host Western State the following evening in the Nelson Physical Activity Center on the CSC campus. 125--Adrian George, NMHU, won by forfeit. 133--Brandon Kile, CSC, pinned Isaac Garcia. 141--Jon Trujillo, NMHU, dec. Chance Karst, 7-3. 149--Chase Clasen, CSC, major dec. Logan Pine 14-4. 157--Jake Otuafi, CSC, pinned Allen Michel, 5:48. 165--Tate Allison, CSC, dec. Kenny Yara, 9-8. 174--Matt Hebel, CSC, dec. Lance Kilgore, 10-3. 184--Luke Allan, NMHU, pinned Jay Westcott. 197--Wade French, CSC, dec. Chris Collins, 11-6. Hwt--Julian Sanchez, NMHU, pinned Andrew Wilson. 125--Isaiah DeLaCerda, ASU, won by forfeit. 133--Jon Andreatta, ASC, dec Brandon Kile, 8-5. 141--Dylan Udero, ASC, pinned Joe Ritzen, 5:23. 149--Chase Clasen, CSC, dec. Noah Hermosillo, 7-6. 157--Jake Otuafi, CSC, dec. Ryan Rochford, 8-3. 165--Koery Windham, ASC, dec, Tate Allison, 4-3. 174--Matt Hebel, CSC, dec. Cole Gustavson, 6-2. 184--Will Tyler, ASU, major dec. Jay Westcott, 11-2. 197--Wade French, CSC, dec, Khalil Gipson, 9-5. Hwt--James Romero, ASU, pinned Rulon Taylor, 1:51.